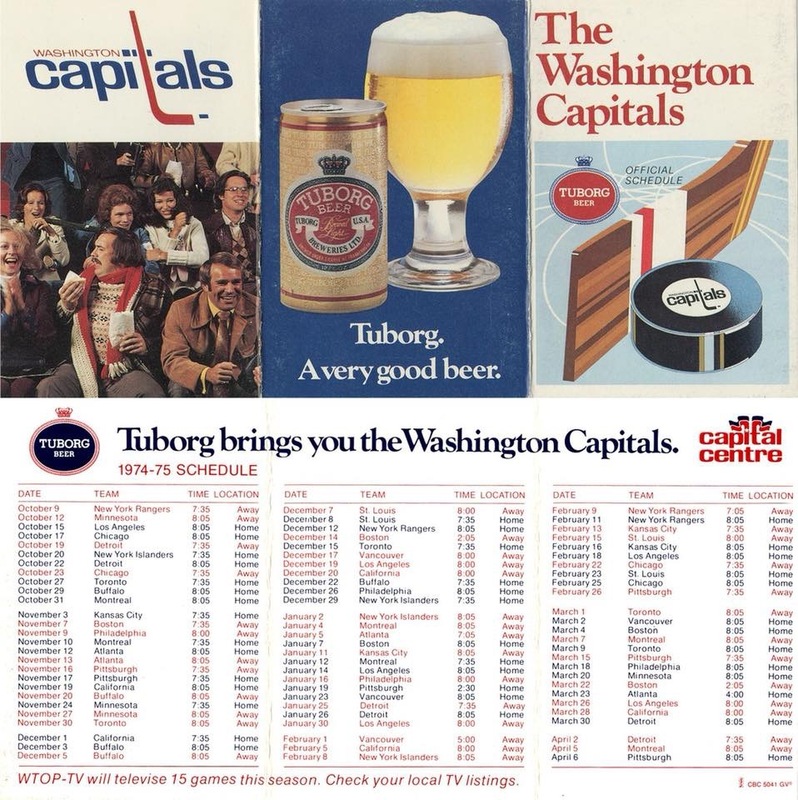 On June 4, 1972, the National Hockey League (NHL) board of governors awarded Washington, DC and Kansas City expansion franchises who would be the 17th and 18th franchises in the NHL. Washington and Kansas City were the winners, after bids from other cities were also considered, including Cleveland, Cincinnati, Dallas, Phoenix, Indianapolis, and San Diego. The franchise awards were conditional, as there needed to be a suitable hockey arena in which to play. 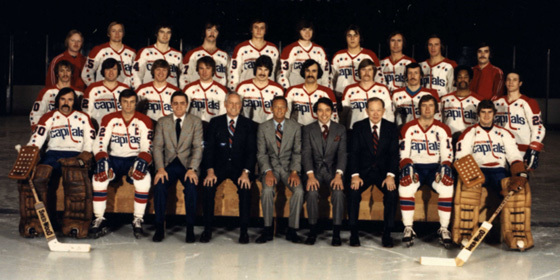 Both teams were scheduled to begin play for the 1974-75 season. Washington owner, Abe Pollin, won the right to father the Canadian pastime in Washington, DC. As an added bonus, he would move the Baltimore Bullets NBA basketball team from Baltimore to the Washington D.C. starting in the 1973-74 season. The NHL entry fee was $6 million (Las Vegas, the 31st and most recent expansion team paid $500 million) but that would only be the beginning of the team’s cost. The plan was to build the Dwight Eisenhower Bicentennial Arena in the Mount Vernon Square region within Washington, D.C. and both the hockey team and basketball team would play there. Residents in the nearby Chinese community had objected to this site, indicating they feared the displacement of their homes and businesses. President Richard Nixon had called the NHL Board of Governors to indicate that he was vitally interested in building the sports arena in the inner-city region. With three teams in D.C., there would also be hope in bringing baseball back there, too. At one point, Arthur Sampson, public buildings service commissioner for the General Services Administration said that the arena could be built in time, provided they concentrated on the sports arena and not the rest of the complex. There was also the caveat that if an arena could not be built in time, the Washington franchise award could be rescinded and given to one of the other contending cities, such as Cleveland. Pollin said that he did not gain any assurances that the downtown arena would be built within 90 days. As a result, he privately financed a $15 million arena in Largo, Maryland. Thus, the Bullets and the newly-named Capitals ended up playing in the Capital Center in Largo. Ironically enough, nearly 25 years later, a new downtown arena was built adjacent to Chinatown and both the Bullets (now the Wizards) and Capitals moved there. 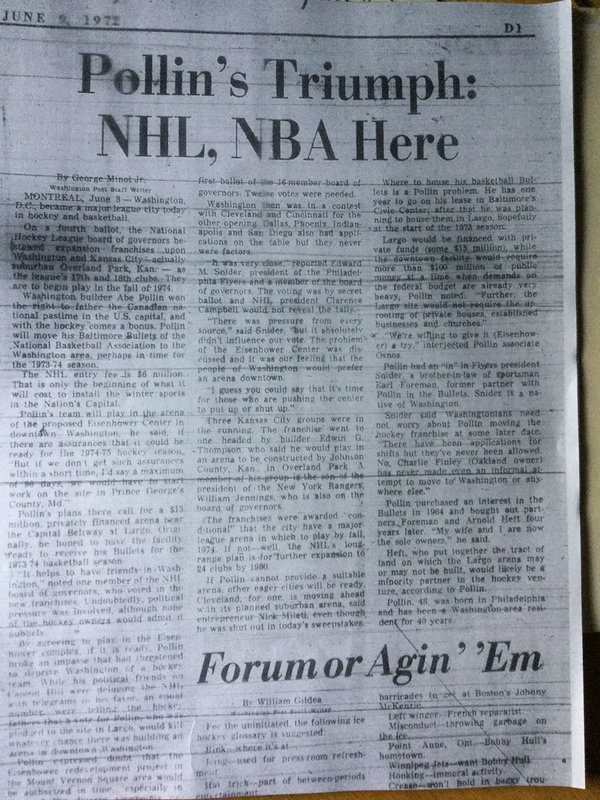 This entry was posted in History, News, NHL, Washington Capitals and tagged Abe Pollin, Diane Doyle, NHL Expansion, Washington Capitals. Bookmark the permalink. Hey Doyle, great article about a great franchise! My first game was 1975 too, sometime in February. It featured a major brawl with most of the bench participating! I wonder if our current fan base can pinpoint just which game it was. —- Great to see Yvon Labre joining the current Caps with all the Stanley Cup celebrations! I remember a ton of fights in a home game vs Detroit, maybe it was that late January game. Check out Hockey Reference web site, that should have box scores from that season. Hey Bill DC! Thanks for the suggestion, I’ll look it up. Even some of the “milder” Caps folk like D Joly got involved, and lots of beer was thrown onto the ice. Ah, the good old days at Capital Centre!